Parcelas has a huger soccer field and a community center in the middle of the mesa. 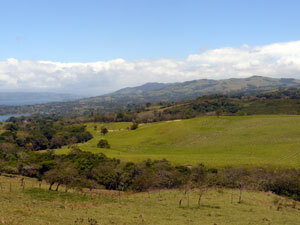 This view is of the neighboring La Tejona area and the Tronadora Peninsula in the distance. 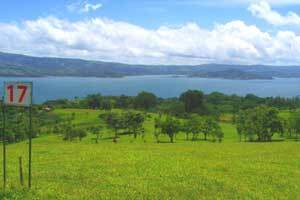 Parcelas is a village on a particularly wide and flattish hilltop between Lake Arenal and the Guanacaste lowlands, extending Like its neighborina area, La Tejona, across the whole hilly mesa from the lake to the western side. On the western edge are views over the town of Tilaran and the Rio Tempisque wetlands. In the area it is possible to buy a Tico home for remodeling, a lot in new gated communities on the eastern side overlooking the lake, or bigger acreages among the surrounding fincas. From here it is 10 minutes to windsurfing on the lake, and there are great lake and volcano views on the eastern side. 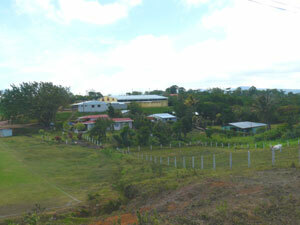 The village is centered by a huge soccer field, and there is a large community center. It takes about 20 minutes to drive from here to the town of Tilaran. There is public bus service. L78 Lake and volcano vistas on 3/4-acre lot. Water and electric in. Resort privileges. $60,000. L17 13 one-acre lots, some with lake views, $15,000 to $50,000. A new home on the northwestern edge has sunset views over Tilaran and the foothills. 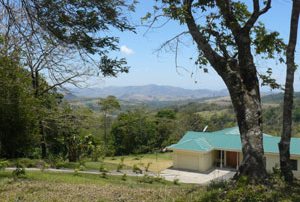 A large lot on the southeastern edge has panoramic Lake Arenal views.